While John Grady’s romantic notions apply most powerfully to his ideal of the American West, they also apply to other values he holds dear for much of the novel. 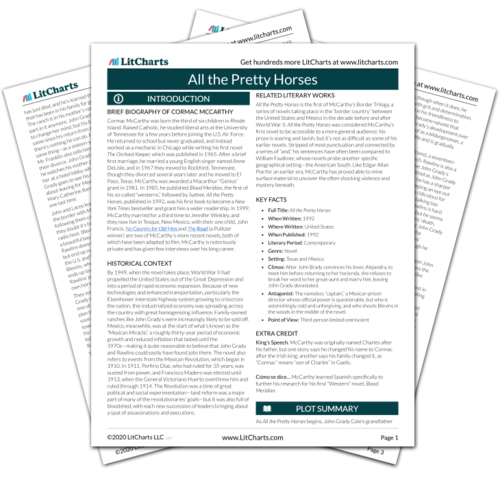 All the Pretty Horses has been called McCarthy’s most romantic novel, and that’s not just because part of it is a romance story: it’s because John Grady believes strongly in the power of love to conquer all, from economic interests to family concerns. Other characters are more realistic. In a sweeping monologue in Part 3, Alfonsa, Alejandra’s great-aunt, attempts to show John Grady just how powerful politics, economics, gender norms, and other social values can be. They’ve impacted her own life directly, and can certainly make love impossible. Alfonsa and other characters have learned to place other values, such as stability and even happiness, above love. In fact, Alfonsa sees John Grady’s stubborn pursuit of his affair with Alejandra as proof that he couldn’t be trusted as head of the family hacienda. As John Grady remains willfully immune to such practicality, the novel portrays his denial of reality as admirable but also, ultimately, both doomed to failure and highly naïve. Romanticism, of course, is more than just romantic love: one meaning of the term is a poetic movement emphasizing individual, subjective experience, heroic action, and the primacy of emotion. Such elements are evident in the way John Grady thinks of Mexico and its citizens, as well as his notions about justice. John Grady feels a deep, personal, and emotional connection to horses—much of the book is taken up simply with lavishly drawn scenes of riding across the mesas and plains of the country. His relationship to horses gives him a perhaps unique understanding of ownership, based less on laws and property rights than on one’s subjective relationship with other living creature. This way of thinking is most intensely depicted in John Grady’s attempt to get his, Blevins’, and Rawlins’ horses back at the end of the novel. The world, John Grady learns little by little, may support Romantic ideals in theory, but in practice a brute pragmatism tends to prevail. The ThemeTracker below shows where, and to what degree, the theme of Romanticism and Reality appears in each part of All the Pretty Horses. Click or tap on any chapter to read its Summary & Analysis. Below you will find the important quotes in All the Pretty Horses related to the theme of Romanticism and Reality. Baena, Victoria. "All the Pretty Horses Themes: Romanticism and Reality." LitCharts. LitCharts LLC, 26 Aug 2015. Web. 21 Apr 2019. Baena, Victoria. "All the Pretty Horses Themes: Romanticism and Reality." LitCharts LLC, August 26, 2015. Retrieved April 21, 2019. https://www.litcharts.com/lit/all-the-pretty-horses/themes/romanticism-and-reality.